"Map of the City Point and Army Line with its Branches and Connections." National Archives RG77 Rds. 196. 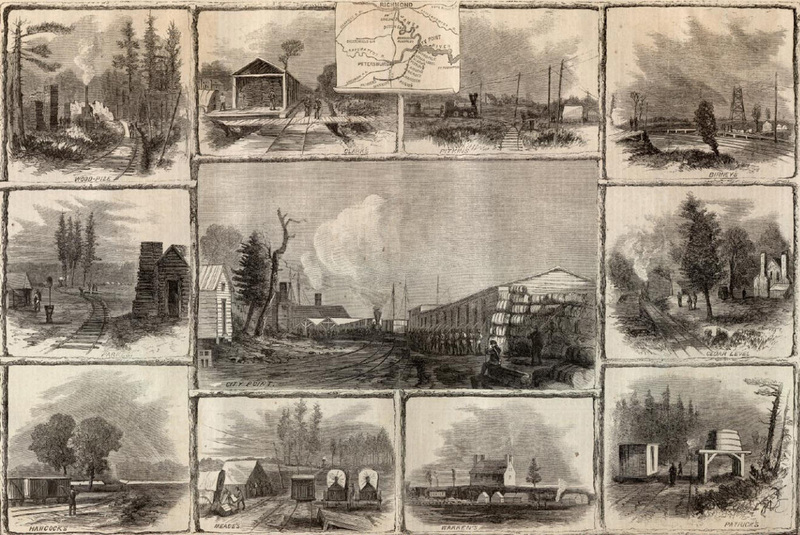 "VIEW OF THE STATIONS ON GRANT'S MILITARY RAILROAD, FROM CITY POINT TO HIS EXTREME LEFT," from sketches by A. W. Warren, in Harpers Weekly, December 24, 1864. NARA 524988. "View of the U.S. Military Railroad, Petersburg Lines," unknown photographer (Russell?). Trestle near Hatcher's Run. A. J.Russell, courtesy Virginia Historical Society. LC 33986. Chief Engineer James J. Moore. After taking up the track of the Richmond and York River Railroad, and removing all the material of value (June 13, 1864), Mr. C. L. McAlpine, engineer of construction and repairs, was ordered to proceed to City Point with part of the Construction Corps and adequate material, in anticipation of an order to build the wharves at that place and reopen the City Point and Petersburg Railroad. The expedition was delayed nearly four days on account of a pontoon bridge stretched across the James River, about twenty-five miles below City Point, upon which the Army of the Potomac was crossing to the south bank of the river. Immediately on the arrival of the construction force at City Point (June 18, 1864) orders were received to rebuild the City Point and Petersburg Railroad; also to construct wharves and buildings for the use of the army in unloading and receiving supplies. An examination was made of the road, and it was ascertained that the bridges were gone, track taken up, and the iron removed for a distance of four miles. From there on to within two miles and a half from Petersburg the track had not been disturbed, but the ties were very much decayed and the gauge needed changing from five feet to four feet eight and one-half inches. By the 5th of July the bridges were all rebuilt, track repaired, and the road was in complete running order for a distance of seven miles from City Point. By the time the repairs were completed a full equipment of engines and rolling-stock had been received, and regular trains commenced running July 7, 1864. ​A large force was kept constantly employed in building wharves, warehouses, and all other improvements asked for by Quartermasters Department. 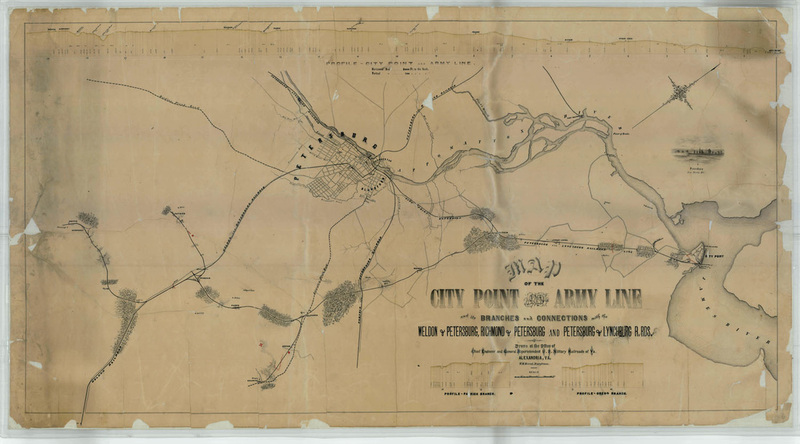 Orders were received July 22 to make a preliminary survey of a branch line of railroad from a point near Pitkin Station (distant five miles and a half from City Point) to the headquarters of the Fifth Army Corps, on the Weldon railroad at Yellow House. The survey was made (without instruments) and everything got in readiness for the proposed extension. An explosion occurred on the 9th of August, caused by the accidental ignition of ammunition stored in an ordnance boat lying at the wharf at City Point. The force of the explosion completely demolished some 400 feet of warehouse just completed and a large portion of the wharves in the vicinity; also a large quantity of supplies accumulated for shipment to the front. The damage to railroad property was very slight, and only a few of our men were injured. 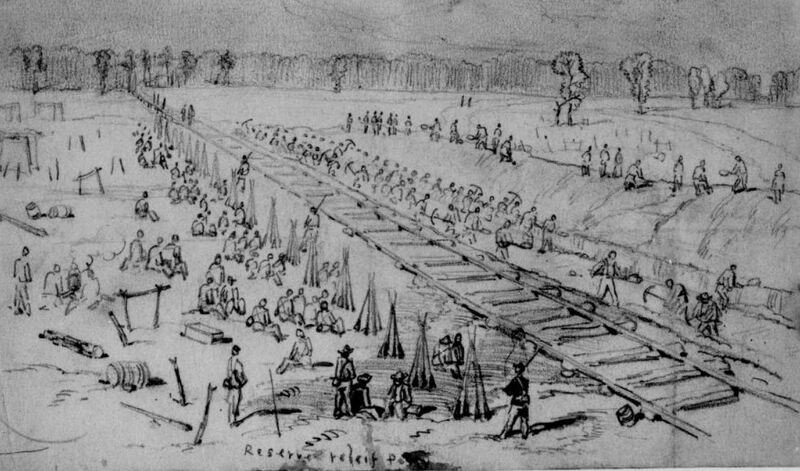 July 26 a force of trackmen equipped with tools were sent to Deep Bottom to report to General Sheridan, for the supposed purpose of destroying the track of the railroad connecting Petersburg with Richmond. They returned July 30 without effecting anything of importance. LC 21253 detail. "Explosion at City Point," drawing by A. R. Waud. ​Again, August 13 another party in charge of John Morgan, assistant engineer, was ordered to report to General Hancock for the purpose of destroying the track on the Weldon railroad. Nine miles and a quarter of track were destroyed, and the iron made useless by heating and then bending the rails. Orders were received August 30 to commence building Army Line from Pitkin Station to Yellow Tavern, on the Weldon railroad. Work was commenced September 1, and by the 10th of September the new line was completed a distance of nine miles from Pitkin Station and fourteen miles and a half from City Point. 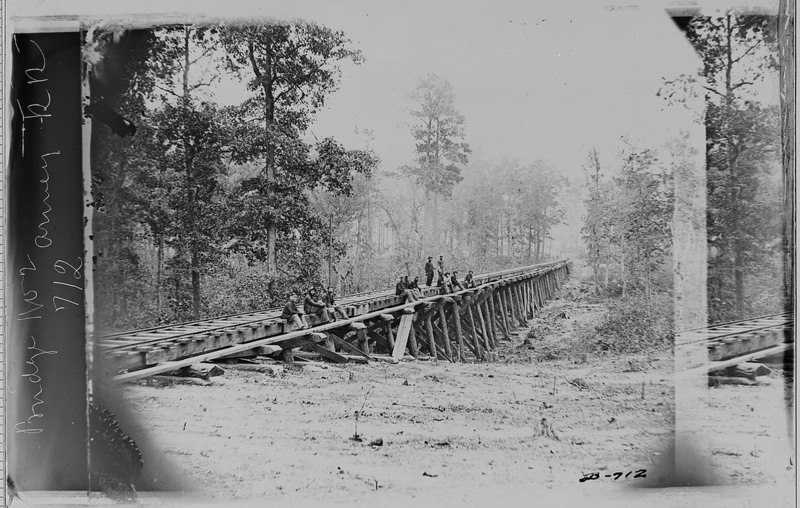 The grading on the new line was comparatively light, but some very extensive trestle-works were constructed. For quite a distance the rebel batteries had full range of the track, and trains passing and our Construction Corps were much annoyed by the constant fire kept up on them. This difficulty, however, was obviated by the construction of a line of earthworks about half a mile in length, completely protecting the road. ​Extensive tracks for the accommodation of the hospitals and bakeries were built; also very large warehouses for the storage of quartermaster, commissary, and ordnance stores. Substantial and roomy wharves were built for a distance of nearly one mile at City Point; also wharves at Bermuda Hundred and Light-House Point. An extension wharf was built on the Appomattox River for the accommodation of the hospitals. Water tanks and steam pumping engines were also furnished to keep up an adequate supply of water. The construction of hospital buildings on a very large scale for the several army corps was ordered October 8. After most of the lumber and other material had arrived at City Point the plans were changed. They concluded to build them more temporary than was at first proposed. One hundred and ten of these buildings were constructed during the fall and winter. While this work for the accommodation of the army was being done the various improvements to facilitate the operations of the road were not neglected. The road bed was put in first-rate order, and the track would compare favorably with any first-class road. During the month of October the yard at City Point was enlarged, switches and sidings were put in, turn-tables were constructed at all necessary points, a substantial and convenient engine-house was built capable of accommodating nine locomotive engines; also shops with all the requisite machinery for the repairs of engines and cars. At all the stations on the line sidings were laid and station-houses built. An average of nine trains, exclusive of specials, were run each way daily, amply supplying the wants of the army. The amount of rolling-stock for the working of the road was increased from time to time, as the demands for transportation became more heavy. ​Orders were received October 22 to proceed with the extension of the City Point and Army Line from General Warrens headquarters at the Yellow House to the Peebles house, a distance of two miles and a quarter. The work on this extension (now called the Patrick Branch) did not commence until November 2 on account of an engagement that took place near where the proposed line was to run. It was completed with all the necessary sidings November 9. The grading was not very heavy on account of our conforming to the surface of the ground. The grades are heavy (a maximum of 228 feet). Eight hundred and fifty feet of trestle-work, averaging twenty feet in height, was built. During its construction the weather was very unfavorable, it raining nearly all the time, making it almost impossible to do any work on track. From November 10 to December 19 the construction force were busily engaged in constructing hospital buildings, repairing wharves, laying additional side tracks, and building quarters for the Quartermasters Department and railroad employees. A large clothing warehouse and extensive commissary buildings were then built; also distribution barracks for the accommodation of the troops passing through City Point. The coal wharf at City Point and a large wharf at Bermuda Hundred were also completed. Trains continued to run on good time without accidents, business constantly increasing. Some days, fifteen trains were run over the road each way. ​Work was commenced December 21 on a branch hue of road running from Hancock Station, on the main Army Line, to Fort Blaisdell, on the Jerusalem plank road. It was completed December 29, but trains did not run over it for some days after on account of the very wet weather, which made it impossible to get the track in good order. January 2 orders were received to extend this branch line still farther, to the headquarters of General Crawford, who commanded one division of the Fifth Army Corps, a distance of two miles and a quarter from Hancock Station. Work was immediately commenced, but owing to the inclement weather progress was not very rapid. The track was laid, 1,040 feet of trestle-work 18 feet high was built, and the line opened by January 20. Station-houses, platforms, and water-stations were built. This line is called the Gregg Branch of the City Point and Army Line. During January a plank road, extending the whole length of the wharves at City Point, was built. ​Our party kept at work till February 8, when they were relieved by Colonel Wrights force and embarked for City Point the same day. The whole force arrived at City Point February 12, in time to take part in the extension of the Army Line. From January 25 to February 12 the construction force remaining at City Point were engaged in constructing quarters, offices, & c., for the Quartermasters Department, repairing and extending wharves, and building a large wharf at Deep Bottom, on the James River, and keeping the track of the City Point and Army Line and branches in good repair. Our forces made an advance to the left of Petersburg February 5, and after three days fighting succeeded in gaining and holding a position on the Vaughan road, a distance of about five miles in advance of their former line. ​An order was received February 8 to extend the Army Line. The proposed extension was located the 12th. The line, leaving Warren Station, ran down the old bed of the Weldon railroad about two miles, then, diverging to the right, across the most favorable ground to the Cummings house, on the Vaughan road, a distance of five miles from Warren Station. Work was commenced February 13 and completed to the Cummings house (Humphreys Station) on the 24th. We also furnished all the necessary sidings, buildings, platforms, water stations, and Y for the proper working of the road. During the progress of this work the weather was very unfavorable, raining almost without intermission, making the ground so soft that it was almost impossible to do any work or get the teams over it with material. Two thousand seven hundred and eighty-one feet of trestle-work was built on this extension, averaging twenty-five feet high. Most of the timber was cut in the woods and hauled to the work with teams detailed for that purpose. ​ A number of hospital cars were fitted up for the purpose of moving the sick and wounded from the front and along the line to City Point. These were kept in almost constant use. Trains were running regularly and amply supplying all the wants of the army. In addition to the regular freight business two passenger trains were run each way daily for the accommodation of mails, officers, and others, to and from the front. At the time of building the Army Line many of the officers of the Army of the Potomac, together with the regular Engineer Corps, denounced this location, declaring that it would be impossible for an engine alone to ascend the heavy grades; and as for furnishing the necessary supplies for the army over it, they considered it altogether out of the question. It was discovered, however, that engines hauled an average of fifteen loaded cars per train, and in many cases twenty-three loaded cars, with one of our ordinary engines, thus demonstrating the practicability of supplying a large army over a temporary road constructed in this manner. ​The total length of track laid on Army Line, branches, and sidings was 21 miles 3,955 feet, and total length of trestle work, 1 mile 1,393 feet, an average of twenty-one feet high. Not much of note in railroad affairs occurred from February 28 to April 3. The construction department was kept busy making additional improvements wherever needed, and building a wharf at City Point in the gap between the quartermasters and railroad wharves. I also increased our force and made heavy additions to our rolling-stock, iron, timber, and other material in anticipation of a movement of our army. 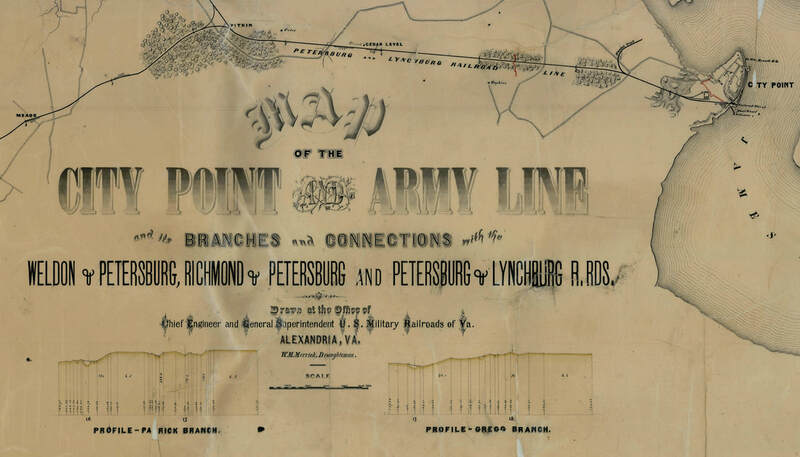 April 3, immediately after the successful advance of our forces, we abandoned the Army Line and commenced relaying the track taken up on the South Side Railroad to Petersburg, our troops having taken possession of that place on the morning of the 3d. The road was opened and in running order to Petersburg April 4. A large force was set to work changing the gauge of side- tracks and switches in yard at Petersburg from five feet to four feet eight and a half inches, to suit our rolling-stock. We also commenced changing the gauge on main line of South Side Railroad and completed it to Burkeville, sixty-two miles from City Point, April 11, and trains commenced running through with supplies to that point. The road was found to be in wretched condition. The ties were decayed and worthless, and most of the iron nearly worn out. For two or three days it was with the greatest difficulty that trains could be got over the road; but very soon the condition of it was improved by placing a large construction force at work renewing ties, relaying and repairing the track. Trains commenced to run regularly and on time without any accident of a serious nature, and easily filling all requisitions for transportation. We also opened the Petersburg and Richmond Rail- road, and regular trains commenced running from City Point to Manchester (opposite Richmond), via Petersburg, April 7. On the 24th of April orders were received through General Ingalls to make the necessary repairs on the Richmond and Danville Railroad and open communication with Danville, and also to advance on the South Side Railroad and rebuild the High Bridge near Farmville, seventy- six miles from City Point. I sent a large force with material to this bridge, but before the work was fairly under way the order was countermanded. April 30 an order was received from you to suspend all work on repairs or rebuilding railroads in Virginia, and only finish such improvements as had been commenced and were nearly completed. In compliance, immediate steps were taken to reduce the expenses in the different departments. As soon as the men could be spared the greater part of the Construction Corps and transportation departments were sent to Alexandria aud discharged. By the 1st of June all the force that possibly could be spared had been discharged, and only a sufficient number retained to insure the successful operation of the roads. Twenty-four new locomotive engines and about 275 new box-cars (all 5-feet gauge) arrived at City Point, loaded on a fleet of about ninety vessels. By your directions this stock was sent to Manchester (opposite Richmond) and there unloaded. A wharf had to be built, long siding laid, and connections made with the Richmond and Danville road for the purpose of storage. Possession was taken of the machine-shops at Manchester belonging to Richmond and Danville road, and a force engaged to put the engines and cars in proper condition before they were sold. Most of the stock had been on board vessels for nearly three months, exposed to all kinds of weather, and was in bad condition when received. 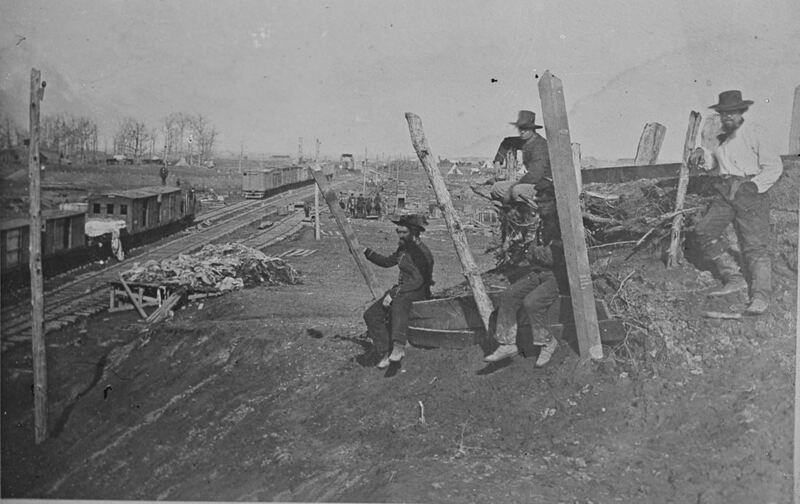 During the month of June the Army Line Railroad was taken up and material brought to City Point. All property not in use was collected from the lines of the several roads and brought to City Point for shipment. Regular trains were run on the South Side and Richmond and Petersburg roads, connecting with trains on Richmond and Danville road, amply supplying all the troops along the lines. A large number of discharged troops were brought to City Point, and transportation furnished a large number of rebel troops returning to their homes. July 3 the Petersburg and Richmond Railroad was turned over to the company, and the Richmond and Danville road was turned over July 4. All material and rolling-stock that could be spared had in the meantime been shipped to Alexandria. We continued running the South Side Railroad from City Point to Burkeville, transporting supplies and large numbers of troops en route north from North Carolina, until July 24. At this date the road was turned over to the company, which closed up our operations of military railroads at City Point. The whole force (with the exception of some sixteen men left to take charge of property, & c.) were brought to Alexandria and discharged. All the property has been removed from City Point, with the exception of some material which will remain there until sold. Mr. C. L. McAlpine, principal assistant engineer, in charge of construction department, and G. M. Huntington, superintendent, in charge of transportation department on this line, were persevering in the discharge of their varied and arduous duties. May 15 Mr. McAlpine having resigned his position, Mr. T. D. Hays was then appointed in charge of all our railroad operations at City Point; and to him I am indebted for valuable assistance rendered. "Verso: "Scene on Branch Road // A working party composed of part of the 2nd corps throwing up works to protect the passing trains from the shot of rebel batteries // [Signed] J.B." Drawing by Joseph Becker, The Becker Collection, Boston College.